In May, Bishop Fellay gave a conference and noted that the CDF has provided him with the authority to judge a case in which charges were brought against a priest of the SSPX. The CDF provided Bishop Fellay (who from their perspective is suspended) to judge the case of a member of a congregation (who from their perspective does not exist). Attached below is Rorate's For the Record and a link to the Vatican Insider article. This action by the CDF is significant because this is objectively the granting (albeit for one case) of one of the six conditions set by the 2012 Chapter of the SSPX. "A procedural rule was established: the superior general and his council will not exercise their own authority to accept a proposed canonical normalization, but will convoke an Extraordinary General Chapter that will have a deliberative vote, with an absolute majority required for acceptance. " This reminds me of the measured pace in which the two pre-conditions for discussions were granted by the Church. PS. I noticed that the 'Resistance' is quite in a lather about this authority being used to judge Bishop Williamson et al. The report clearly indicates that it was concerning a single case. That the 'Resistance' rashly assumes it was Bishop Williamson et al is probably due to their exaggerated opinion of their importance. He announced it himself during the course of a sermon at Our Lady of the Angels church in Arcadia, California, on May 10, 2015: the Congregation for the Doctrine of the Faith has appointed the Superior General of the Society of St. Pius X (SSPX), Bishop Bernard Fellay, as first-instance judge in a case involving a Lefebvrian priest. The former Holy Office is in charge of dealing with a number of “delicta graviora”. The one that pops up most frequently, is the one involving the sexual abuse of minors. Fellay presented this as an example of the “contradictions” in the Holy See’s approach to the Fraternity. Readers will recall that another important sign came last April, when the Archbishop of Buenos Aires gave the green light for Lefebvrians to be registered by the Argentinian government as a “diocesan association”. Also, a large group of SSPX pilgrims was allowed to celebrate the Eucharist in Lourdes Basilica. 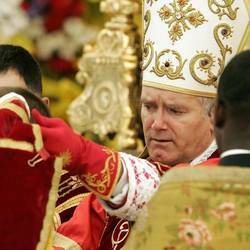 So why does Fellay speak of a contradiction? His comment was in reference to last February’s pilgrimage to Rome, which saw the participation of 1500 faithful. The pilgrimage was organised by Dominican sisters with links to the SSPX. A request was submitted to the Pontifical Commission Ecclesia Dei for mass to be celebrated at the altar of St. Peter’s Basilica. On this occasion, however, the heads of the Commission, decided that the celebration of a mass by a Lefebvrian priest before existing problems were resolved in view of canonical regularisation and full communion would have sent out the wrong signal. Nevertheless, Pope Francis gave his approval to a proposal for the requested mass to be celebrated in St. Peter’s Basilica but by an Ecclesia Dei priest and according to the old rite. Leaders of the Fraternity declined the offer. Still, the Congregation for the Doctrine of the Faith’s appointment of Fellay as first-instance trial judge, shows that progress is being made in terms of the dialogue between the Church and the SSPX.